Wind Energy for the Rest of Us straddles two—or more—worlds. The book is about wind energy. It’s not just about small wind turbines. It’s not just about large wind turbines. It’s about the depth and breadth of wind energy, encompassing more than either type of wind turbine. It includes water-pumping windmills and sailing ships. It’s a sprawling book, one minute discussing how to install small wind turbines safely, the next explaining how farmers in Indiana can earn millions by installing their own multimegawatt wind turbines. 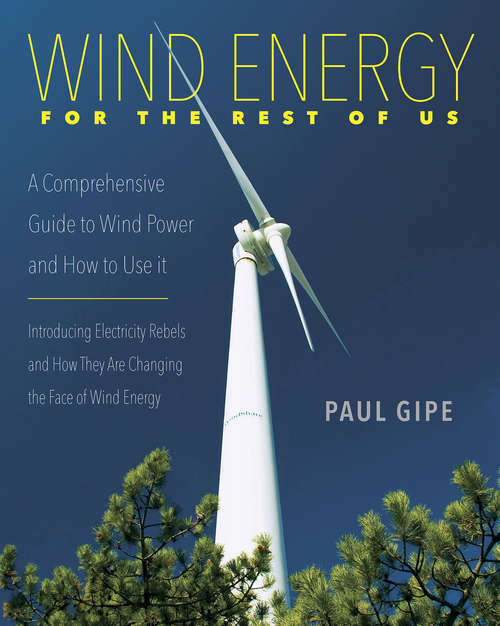 If it’s a book hard to categorize, that suits its author, Paul Gipe, who likes to think he’s hard to categorize after four decades at the frontiers of renewable energy. His book tells the story of modern wind energy in all its complexity and introduces a North American audience to the trailblazing electricity rebels who have launched a renewable energy revolution in Europe. The book debunks novel wind turbines their promoters claim will generate electricity “too cheap to meter,” and rebukes revisionist historians who falsely argue that it was the aerospace industry that delivered today’s modern wind turbines. Gipe explains why new wind turbines are part of a silent revolution that is changing the way we use wind energy. This revolution doesn’t garner headlines, but is making wind turbines more cost-effective in more places than ever before, lessening the need for new transmission lines, obviating the need for storage, and fueling rapid growth. Gipe refutes many common myths surrounding wind energy and argues persuasively that wind turbines are productive, effective, and environmentally sound. Gipe argues that wind energy is too important to be left to electric utilities and their subsidiaries alone. Wind energy is also for the rest of us, he says. It is our resource. We can develop it and we can own it--ourselves.